Happy St. Patty’s Day! Okay, about two months too late. 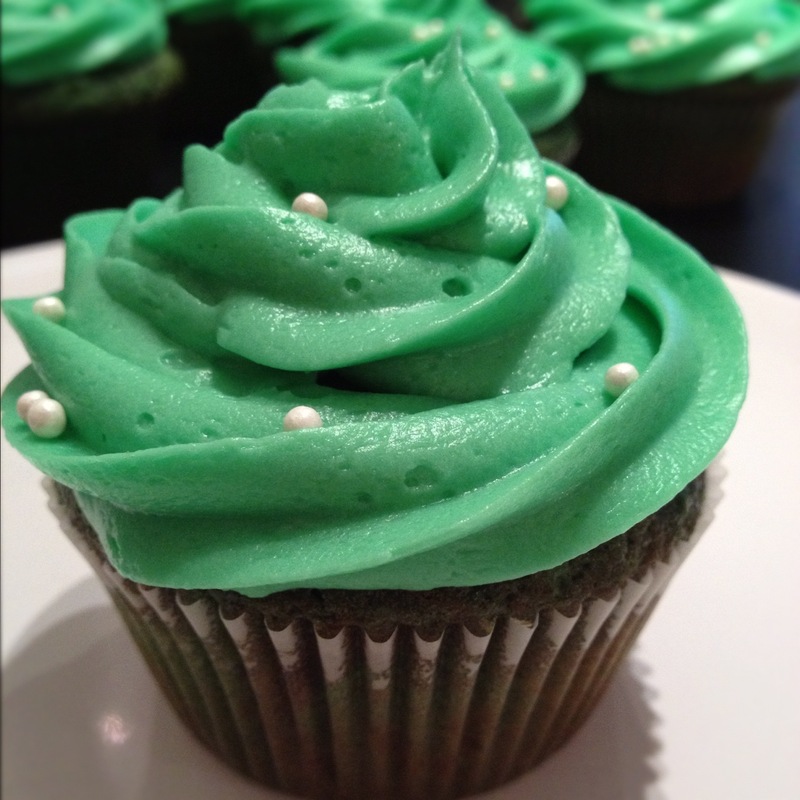 I apparently wrote out the entire recipe for these cupcakes but never finished the post or published it, so here are my St. Patty’s Day cupcakes. Since I’ve done the Irish Car Bomb cupcakes, I wanted to bring a different kind of cupcake to the Southie St. Patty’s Day parade. 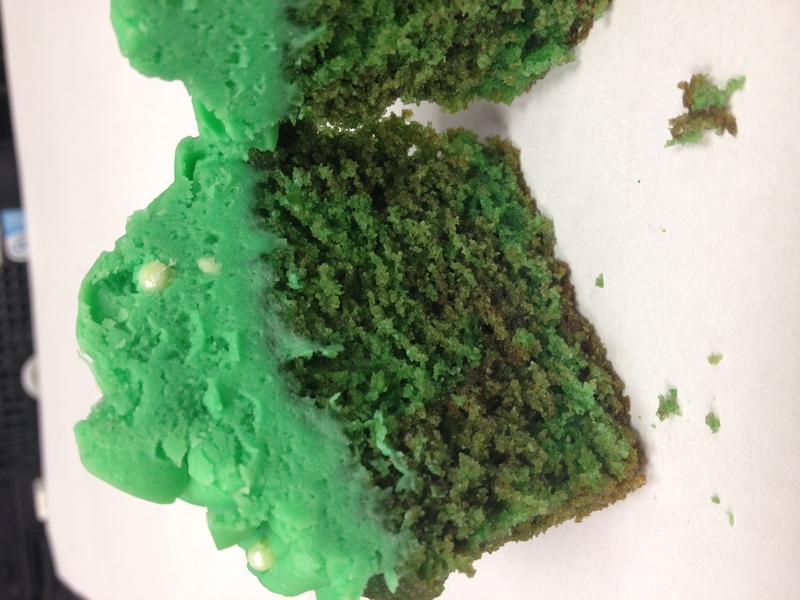 Why not a green velvet cupcake in honor of the day? Lots of people are all about the red velvet and all you have to do is change up the color for a different kind of cake, so why not? The verdict on these cupcakes? Well even though people told me that they liked them, I wasn’t really a fan of these. They had a really strange color pattern in the cake with the mixture of the cocoa and the green food coloring. I just didn’t find the color appealing. Maybe less cocoa next time? Also, I wasn’t a fan of the flavor. Everyone at the parade ate them and when I brought the leftovers to work, they went like hot cakes. I was actually surprised because I thought they almost had a bitter taste to the cake. But some people are just into cupcakes and will eat any kind. I think I tend to be a little pickier than the average cupcake eater. I did have a drunk Southie woman stop me while we were walking back to the car and offer my money for a cupcake. I gave her free cupcakes and for some reason my phone number because she wanted to buy cupcakes but I didn’t have business cards, stupid, I know (on a side note I am working on business cards, so if anyone wants to make me a cupcake logo, that all that’s holding me back). Would I make these again? I think I would with a few tweeks to the cupcake part. I would probably use gel food coloring so that I could use less coloring. I tend to think that that could possibly eliminate the taste I didn’t like because I had to use almost an entire bottle of green food coloring to get the color. I might also use a little less cocoa powder if I wanted to make sure the color was better in the cake. I wouldn’t call these cupcakes a failure by any means since they did have some good parts to them. Try them for yourself, maybe you’ll like them a little more than I did. I can’t even tell you how long I’ve been wanting to seriously up my frosting skills. 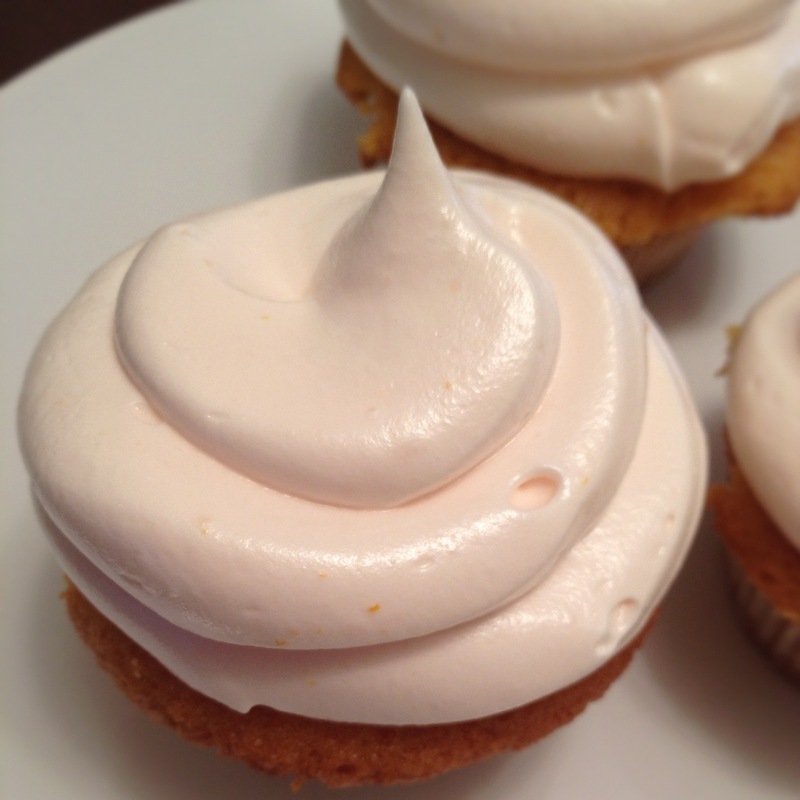 I have this huge set of frosting tips but I always use the same ones to pretty much swirl frosting on top of my cupcakes. I’ve been dying to take a Wilton cake decorating class but it’s really hard for me to get there after work because I have to go home to get my car first. I figured YouTube could be the next best thing to taking a decorating class. 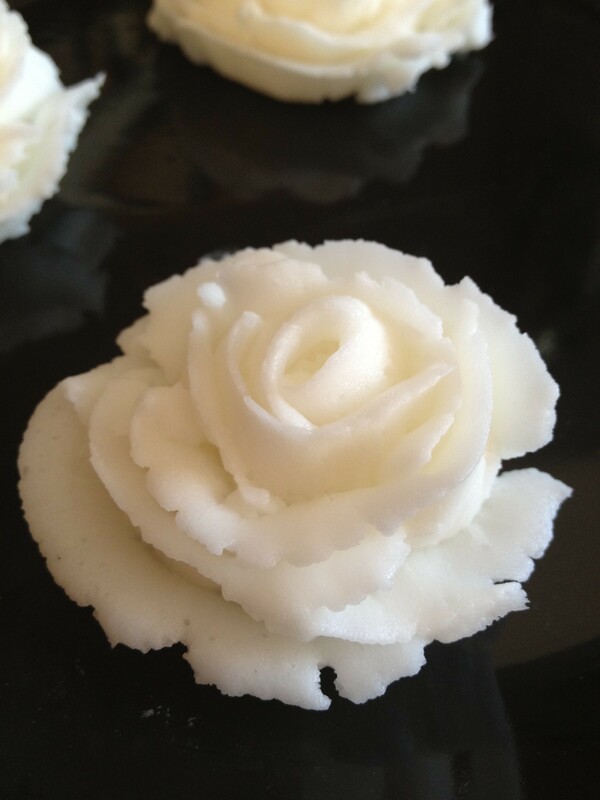 I mean, I discovered how to swirl the frosting to sort of make it look like a flower, so they must have a bunch of how-to videos to make frosting flowers. They do! And they’re really good, in fact they’re so good the people on them make it look too easy. I almost don’t even want to show these pictures but it’s all about practice, so I’m putting them out there even though they’re so far from perfect, I can’t even deal with it. I can’t figure out how to keep the edges of the frosting from cracking , maybe my frosting is too thick? It was just a test batch that I used for practice, so I’m thinking of thinning it out next time to see if it’ll help. I have no idea how people can do it so well but they do it at the grocery store, so it can be all that hard, can it? I mean I don’t know but I assume Stop & Shop doesn’t hired trained pastry chefs or anything. It’s definitely a tough adventure but I’m going to keep going until I can make beautiful roses. Pinterest quickly became my favorite pass time ever. I can’t even tell you what a sad day it was when I discovered it was blocked at work. Now what am I going to do to avoid doing work? I do all of my pinning from home now, so the frequency has definitely died down but I still find amazing looking cupcakes to add to my cupcake wish list board. I came across a pin for Blue Moon cupcakes and decided to add them to the wish list since they were a fun idea, but I didn’t think I’d really make them any time soon. I wanted to make some cupcake this weekend but decided I only wanted to do something new so that I could write about it. 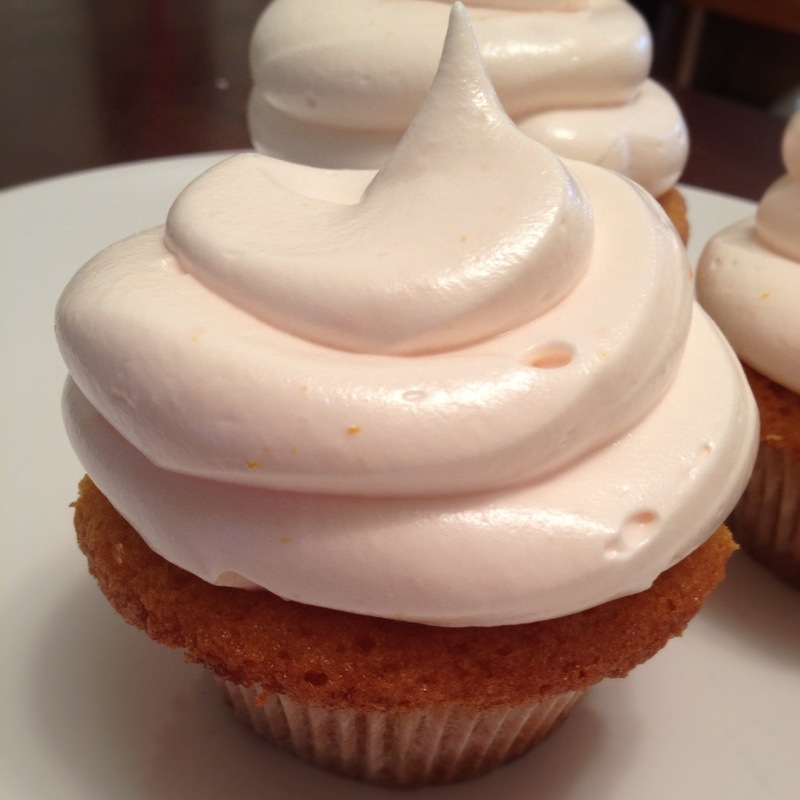 Of course I decided to consult my Pinterest board and found the Blue Moon cupcakes which I had forgotten all about. Boy cupcake likes Blue Moon, so I decided I’ve give them a shot, I mean how bad could beer and a cupcake be? In a saucepan, mix sugar, water and cream of tartar. Cook on medium heat until sugar is dissolved and mixture is bubbly. In a large bowl, beat egg whites, vanilla and orange juice until soft peaks form. Slowly add hot sugar mixture, beating continuously. Beat for 7 minutes until stiff peaks form. The smell of Blue Moon while they were baking had me really excited for these. When they came out of the oven, I brushed them with a little of the leftover beer in the bottle before giving it to Boy Cupcake to drink. This made them super moist and I think added some more beer flavor since it kind of cooks out. I frosted these with a crap ton of frosting and there definitely could have been less frosting (I know, that sounds like a crime to say). These were a win. The cake was moist but fluffy and the frosting was super light and almost marshmallow-like. There was a lot of orange flavor in the frosting, which I might tone down next time so that you could taste more of the beer but overall they were “refreshing” according to Susical and “F*ing awesome” according to Boy Cupcake (he’s so eloquent with words). You’ll have to excuse me for playing catch up here but it seems like I make lots of cupcakes and never take pictures of them so they never make it to the blog. Or I forget I take pictures since they get buried deep in my email, so a post never gets made. I was trying to clear all of the junk out of my gmail and I found these pictures from before Christmas time! But I figured I’d post about them because they were delicious (I mean, aren’t all of my cupcakes? ), and festive not only for Christmas but the wintertime. I had a long debate about what kind of cupcakes to bring to our family Christmas get together. I wanted them to be festive for the holidays but they also had to be something special. I scoured Pinterest…which I’m sure I’ve mentioned is just about the best website out there. 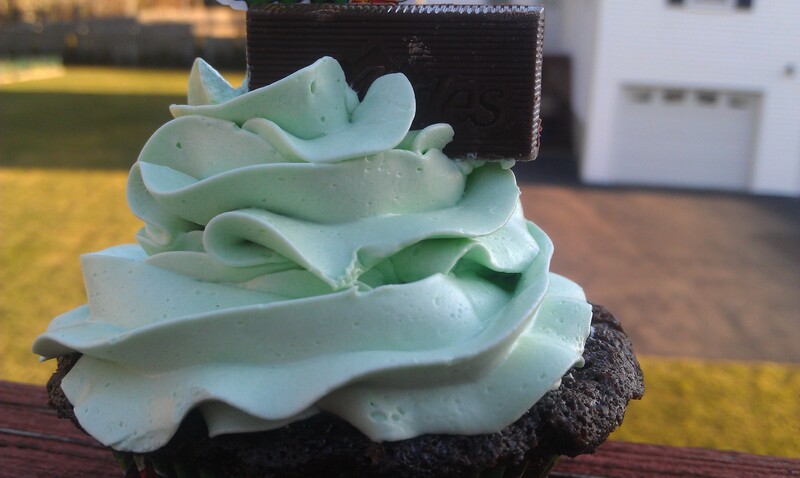 And finally decided on Andes Mints cupcakes. Everyone likes mint and chocolate together, right? And if you don’t, Santa is going to leave a lump of coal in your stocking. In a large bowl, stir together sugar, flour, cocoa, baking powder, baking soda and salt. Mix together eggs, milk, oil and vanilla; using a handheld electric mixer or an electric stand mixer, beat on medium speed for 2 minutes. Stir in boiling water, the batter should be on the thinner side. Repeat the process until the mixture is smooth. Stir in the peppermint extract and powdered sugar, whisking until smooth. Let the mixture cool to room temperature (but don’t let it get too stiff) and pour it into a squeeze bottle or a ziploc bag. Add the butter, one piece at a time, and beat until incorporated after each addition. Don’t worry if the buttercream appears curdled after all the butter has been added; it will become smooth again with continued beating. Add mint extract, and beat just until combined. Switch to the paddle attachment, and beat on the lowest speed to eliminate any air pockets, about 5 minutes. 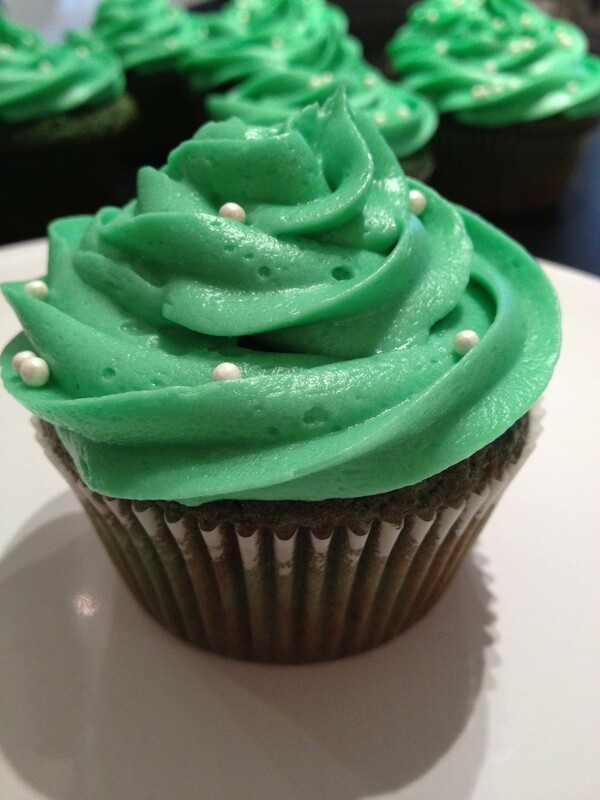 Add in a few drops of green food coloring at a time until frosting reaches desired color. Everyone at the family Christmas party loved these cupcakes. The chocolate mint really made them special, it tasted like there was an Andes Mint candy inside of them. The cake was very fluffy but really stood up to the mound of frosting on top. 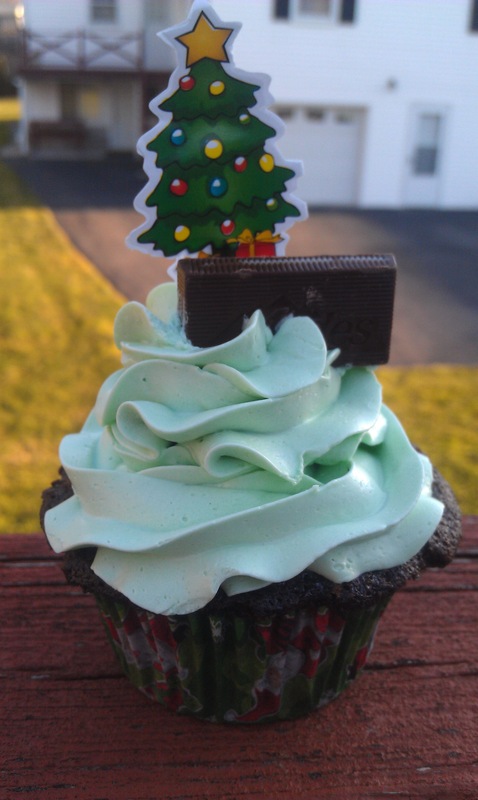 These are the perfect wintertime cupcake if you like chocolate and mint, and let’s face, who doesn’t? I’m putting these on my holiday party go-to cupcake list because they’re definitely not as hard as them seem with all of the ingredients and directions. All Things Cupcake: Duck Tape! Enter your email address to regular cupcake adventures!